"BODY GOLD® is a rich, whipped cream specifically designed for body use. A luxurious blend of all-natural creamed oils, BODY GOLD® is a serious cream that melts at body temperature, leaving the skin smooth, soft and with a youthful, healthy glow. This powerful cream combats the crepey texture skin on the arms and body, deeply penetrating the skin without clogging the pores. Packed full of nutrients and vitamins, BODY GOLD® improves the skin’s elasticity, encouraging new cell growth while preventing further signs of aging." HTY Body Gold was a bit of a surprise, it came in a box that looked super fancy. The leopard print jar, (totally love!) which contains a somewhat large pot of thick creamy whipped anti aging greatness. After reading the long list of instructions, I wondered where exactly on my body would I use the cream. Upon reading the instructions further, I learned HTY Body Gold is made with all natural ingredients. Wow! It's rare nowadays for anything to be all natural, including people! try a serum or something for my under eye area. I did like the body gold on my face too, I don't know if this is bad or not, but I used it on my neck area to make me look a bit more youthful and I think it did work! I feel like it gave my skin a tiny bit more of a younger glow. Very happy with results. The only downfall would be the price tag. $160 for a 12 ounce jar is a bit over my budget, but if you can afford the price I would say invest! The older you are the more you would need this. For sagging skin on your arms or legs, and of course your chin and neck. It also temds to be a bit greasy so don't go overboard, a little goes a long way. The HTY Body Gold contains many things your your skin needs, like Beta Carotene, Vitamin A, Vitamin D & Vitamin E, among others. 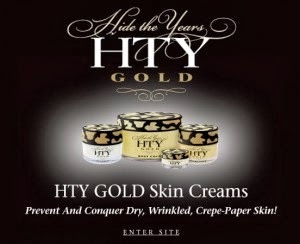 The HTY Body Gold is available for $160 for a 12 ounce jar on their website. I would recommend this for anyone over the age of 40 with sagging skin anywhere on the body. If you're under 40 I probably wouldn't bother unless I had quickly aging skin. Disclosure: A press sample was sent to me for consideration from PR for the purpose of this review.